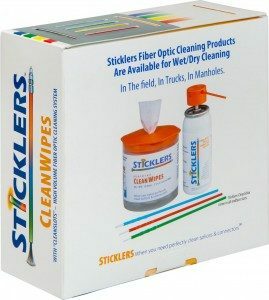 When dampened with the Sticklers® Fiber Optic Splice and Connector Cleaner, each CleanWipes™ Singles will provide the convenient “wet-dry” end-face cleaning which has been shown to deliver improved results. 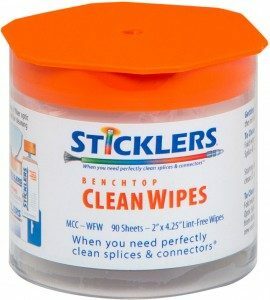 CleanWipes™ Singles are made from a field-proven, lint-free polyester fabric that resists linting and tearing, even on LC end-faces. 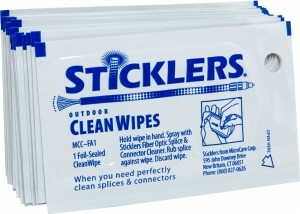 The wipes contain no cellulose which might contaminate surfaces and no glues that might scratch end-faces. 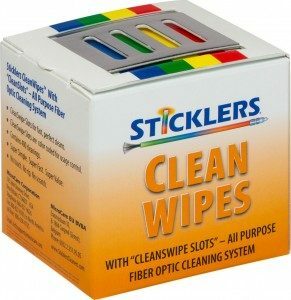 Each wipe can clean up to six connector end-faces.